A quarter of a million people have visited a viewpoint set up to look at birds of prey at a Yorkshire Dales beauty spot. 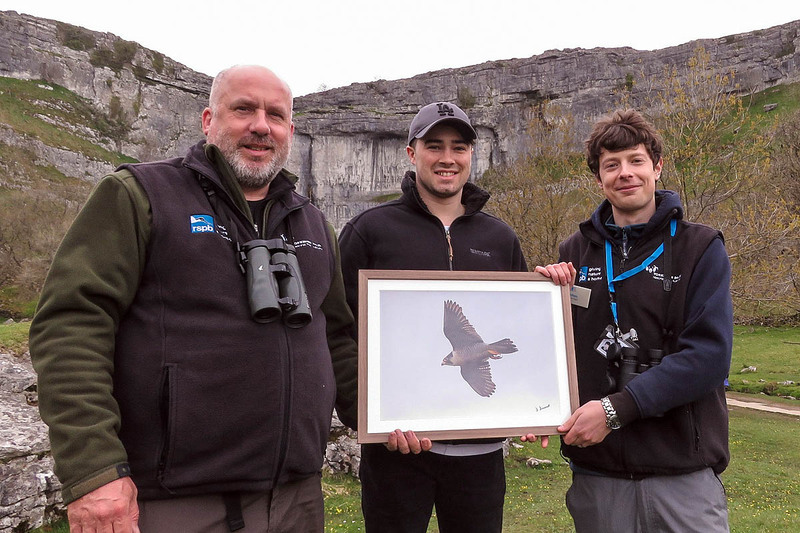 Bosses at the Malham Peregrine Project presented a signed photograph of a peregrine falcon to the 250,000th visitor Jamie Brown. The 25-year-old from East Morton, Keighley, in West Yorkshire, arrived just in time to see the male peregrine leave a ledge high on the 80m limestone crag and swoop above the heads of onlookers. The project, which allows visitors to view a pair of the world’s fastest birds at the site in North Yorkshire, is a partnership between the Yorkshire Dales National Park Authority and the Royal Society for the Protection of Birds. It is now in its 16th year. The free public viewpoint, at the base of Malham Cove, is open from 10.30am to 4.30pm five days a week, from Thursday to Monday until 30 July. RSPB and YDNPA staff or volunteers are on hand to show people the birds through telescopes. Mr Brown, who was on a visit home to see his parents, said he’d loved seeing the peregrine. “It was great to see him through the telescopes up on the ledge – and amazing when he flew above our heads. The peregrines’ nest site is high up on the cove. Unlike last year, the nest is well into a crevice, rather than close to the edge, so it is difficult to get sight of it. However, it is now known that this year’s chicks have hatched, because the adult male has been seen taking food into the nest for the first time. Mr Brown received the framed photograph of one of the peregrines from Dave Dimmock, who took the picture. National park wildlife officer Ian Court said: “Thank you to Jamie for posing for photos. 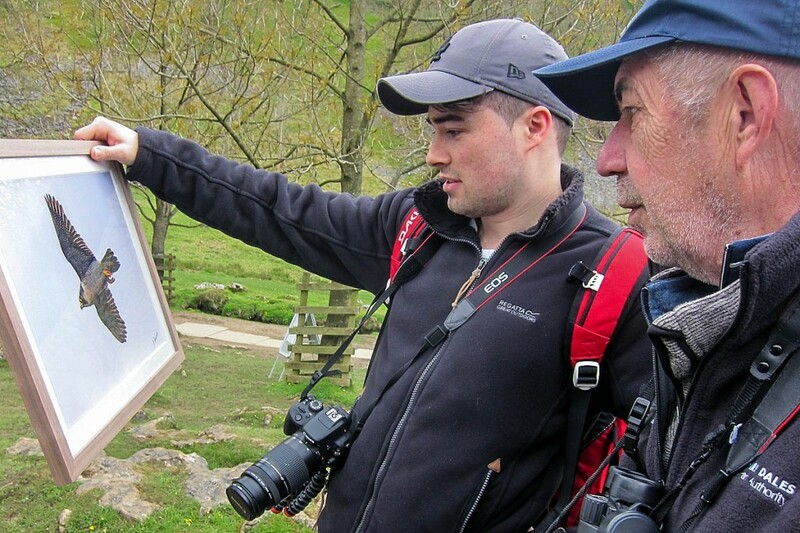 He realised what a big moment it was for the Malham Peregrine Project to receive its 250,000th visitor. “The peregrines at Malham have been huge for the Yorkshire Dales national park, both from the point of view of enthusing people about wildlife and drawing people in to the benefit of the local economy. RSPB area manager Anthony Hills said: “We are delighted to have welcomed quarter of a million visitors to the Malham Peregrine Project. Peregrines are capable of reaching speeds of up to 320kph (200mph) when diving for prey, qualifying them as the world’s fastest animal. A weekly update on the Malham peregrines can be seen throughout the season on the Nature in the Dales Facebook page.